We’re excited to announce a new lead author of Two for Tuesday… Big “I” Markets’ own Michael Welch! After 10 years in the trenches with Big “I” Markets, Michael knows BIM products and BIM agents and is excited to share weekly updates with you. Welcome, Michael! Did you know that not all fire sprinkler systems are filled with water? A dry sprinkler is filled with compressed air and that means they can be used in unheated areas. When a fire occurs the air is pushed out, the pipes fill with water, and (hopefully) puts the fire out. The problems start when the system develops a leak. Water can fill the pipes in the unheated areas which can then freeze and burst. A yearly testing along with visual inspection during freezing weather can help prevent this. Fireman's Fund has more suggestions and offers other advice for you to give your clients about winterizing their facilities. Of course, to be your clients you have to be able to offer them a great product and you have access to that through Big "I" Markets. The Commercial Lessors Risk from Fireman's Fund gives a great product with superior service. Fireman's Fund American Business Coverage offers three (3) classes of Property Owners, also known as LRO (Lessor's Risk Only). All three are high target classes. Single tenant and multi-tenant buildings with various tenants including retail tenants, restaurants, service, shopping centers, and office buildings. All tenants must maintain General Liability insurance with limits at least equal to the insured's primary Business Liability limit of insurance, and name the insured as an Additional Insured on their policy. If a building is more than 25 years old we need year of update for electrical, plumbing, roof, and HVAC. Buildings in excess of 4 stories require a full automatic sprinkler system. 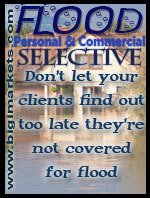 For full coverage details and availability log into www.bigimarkets.com and click on Commercial Lessors Risk. This morning when my alarm rang at 6:00 EDT on the dot, I had a lovely, misguided thought. "Ah, Saturday!" I mused to myself. "I can't wait to relax. It's been a tough week." Ahem. After realizing my mistake, I smiled and jumped in to the day. But I couldn't help but think of a recently retired friend who told me that life after the grind is great. "Every day is like Saturday!" he said. So how are your retirement plans and savings coming? Did you know the Big "I" has solutions for you on this front as well? With Big "I" Retirement Services, Big "I" members enjoy competitive prices, great coverage and excellent customer service to cover most benefit needs. Big "I" members now have the option of participating in the Big "I" MEP 401(k) Plan sponsored by Big "I" Retirement Services, LLC. The multiple employer plan also known as the MEP, is a great way to lower your overall retirement plan costs while receiving consulting, helpful educational tools and low cost investment options. Big "I" Retirement Services, LLC has partnered with national firms to provide a unique member only plan that simplifies plan sponsors administrative responsibilities while limiting your fiduciary exposure. By partnering with Mesirow Financial, a 3(38) fiduciary and MVP Plan Administrators, a customer service oriented record-keeper, the Big "I" MEP 401(k) Plan is designed to maximize cost savings and our unique association design. 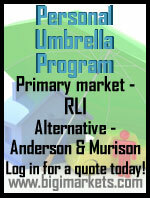 Learn more by contacting Christine Muñoz at christine.munoz@iiaba.net. And may your retirement be full of a long row of lovely Saturdays! In the classic Christmas Song "Home for the Holidays" the lyric "From Atlantic to Pacific/Gee the traffic is terrific" always struck me as funny. I have to admit I usually substitute "horrific" when I sing it. I can remember as a child driving to Michigan and looking out the back window of our station wagon at all the cars backed up behind us on the PA Turnpike. Being stuck in a car for most of a day was always worth it to see all my relatives. As a southerner, Christmas in Michigan was magical. They always had snow on the ground whereas back in Virginia we rarely got any real snow before mid-January. It was filled with lots of family, love, laughter, and always the smell of coffee. 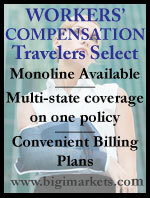 Holiday travel can be stressful, aggravating, and expensive. Overstuffed airplanes, delayed or missed flights or connections, the heartache of lost luggage… Traffic jams, construction or weather delays, mechanical breakdowns/flat tires… lost hotel/motel reservations pointedly illuminated by the "No Vacancy" sign. The list goes on. Yet apparently a lot of our fellow Americans think the potential hassle is worth the destination if the number of them that headed out this past Labor Day is any indication of the coming holiday season. Not everyone is heading for Grandma's; many are heading to Mexico, Europe, Caribbean beaches, or even cooking school vacations. As the busy travel season approaches, offer your clients the peace of mind that comes from having Travel Insurance with Travel Insured International's Worldwide Trip Protector products and their 24/7 Travel Assistance Services. Review the product guide and comparison chart with your client. When you are ready for coverage to be issued, click on "Request a Quote" in Big "I" Markets and provide the necessary information. A credit card will be required to issue coverage. 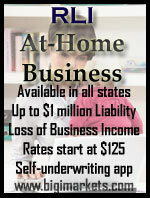 Coverage will be issued and confirmed in Big "I" Markets, and is currently available to members in all states. Surprise! The participation in agency partnerships like aggregators, franchises, clusters, huddles, alliances/networks does not decrease with the size of agency. At least it doesn't if the sample in the 2014 Best Practices Study Update is any indication. 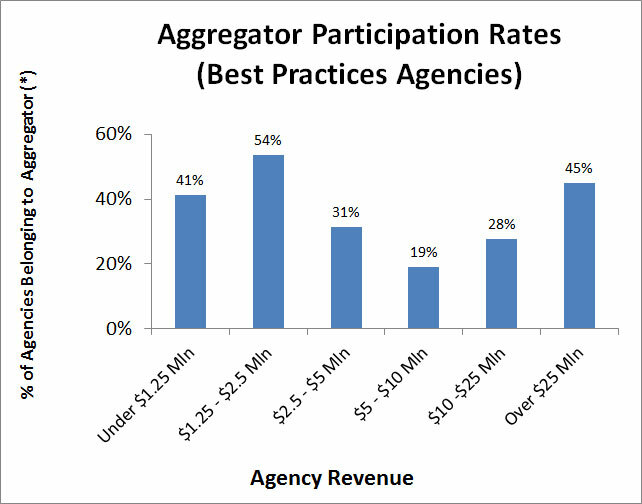 I might have guessed participation in aggregators would decrease as agency size increases but this is not the case based on Best Practices agencies. 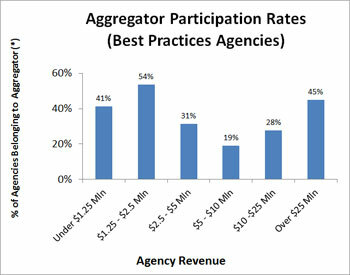 Note the size groups are based on agency revenue (aka predominantly commissions). To convert agency revenues to premiums, use a multiple of 7.5-times as the industry average commission for PC Agency Companies is about 13%. If you want to compare your agency to the Best Practices average, +25% Profit and +25 Growth agencies, the study is available under the "Resources" tab at www.iiaba.net. The partnerships listed by agencies participating in the 2014 Best Practices study include (alphabetically): ARM, Assuralliance, Assurex Global, Bainswest, Benefits Advisors Network, C2 Centric, CAA, Combined Agents of America, Consolidated Insurance Agents, Continental Insurance Agency Alliance, DCS Risk Management Group., Empire Spectrum Group, Georgia Agency Partners, Inc., Globex, Insurance & Risk Managers, Insurors Group, Intersure, ISU, Keystone Insurance Group, Keystone Insurers Group, Lionstreet, Marketsource, Memphis Insurance Group, North American Insurance Brokers, Northern United Agents Alliance, Northlake Insurance Group., ResourcePro, Secure Risk/Shared Agency Services, Select Prism, SIAA, The Iroquois Group, TIA, Trusted Insurance Alliance, United Benefit Advisors, and Worldwide Broker Network. Congrats to our agent in Iowa on an contractor bond sale of $11,223 in premium!